flowers and plants. Able to hold 48 8-pack flats and have up to 17 shelves, this cart can display hundreds of plants and flowers. Featuring a wire grid on the sides and back for optimal containerization which also eliminates the need for additional wrapping of products. 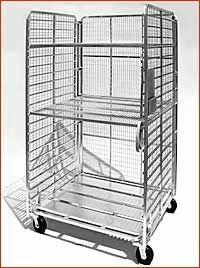 With adjustable shelving for many different positions, respectively, and a depth of 43", this heavy duty cart can handle your heavy duty products. The 17 shelf rails are spaced 4" apart for convenient shelf placement and maximum pay load and enables you to handle large volumes quickly and efficiently, with a 1,500 pound load capacity, this zinc plated cart is a necessity for any efficient nursery operation. Additionally, this cart is forklifable, thus increasing productivity.